In the late 19th century Dr. William Coley noticed a regression in the cancers of some of his patients who developed feverish infections. He concocted a mixture of bacteria, which he called “Coley’s toxins” in an effort to trigger patients’ immune systems to fight their tumors, along with the raging infection. At the turn of the century at Coley’s hospital, now Memorial Sloan Kettering Cancer Center, chemotherapy and radiation, which were more easily controlled and administered, were evolving and eventually supplanted his techniques. Although chemo and radiation continue to dominate the cancer treatment field, immunotherapy research has resurfaced. Jimmy Carter’s metastatic melanoma is in remission, and John McCain’s glioblastoma was mitigated by current immunotherapy treatments. The presentation will outline the most common emerging immunotherapy techniques, the theories behind them, and their success rates. What ideas would you like to present? Description: Jack’s presentation focused on the breadth and importance of the CIA’s mission, the challenges of getting and keeping the best possible employees, what the CIA does and doesn’t do, who cares, and why it takes so much money to keep doing what it does. He will take questions after the presentation and likely will not have to wimp out on the answers too often. Jack Davis' Bio: Jack escaped Baton Rouge by joining the Army in ‘61, was assigned to Army Intelligence and served two years on the northernmost Japanese island of Hokkaido as part of a large US activity to electronically snoop on Soviet military activities in the far east. In ‘64 he reentered LSU and bounced around in engineering, architecture and economics receiving a BA in Economics in ‘67 and pursued a MS in Systems Management from USC in the 1970s. Jack worked his way through school with the GI Bill and working for AT&T, the Bell System, Louisiana Electronics and as an audio engineer for a radio station. Upon graduation he was offered positions by the CIA, NSA and DIA. Having had enough of the military Jack chose CIA to interpret satellite photography of the USSR and later as a physical scientist analyzing Soviet and Chinese missile and space tracking capabilities. Other positions included: a stint writing and coordinating articles on Soviet and Chinese missile and space developments for President Carter, Recruitment Coordinator for the CIA’s Directorate of Intelligence, Executive Secretary of a Pentagon committee that coordinates intelligence positions among our allies, several management positions and a few more squirrely projects he still can’t talk about. Upon retirement Jack was awarded the Career Intelligence Medal by the Director, CIA. He is a co-author of a waiting-to-be-published book on CIA intelligence breakthroughs in the heyday of interpretation of early satellite photography. Jack’s other interests include: sailing, genealogy, shooting, wilderness backpacking, voluntary simplicity, sustainable living, sustainable economics, environmental issues, sustainable radio communications and SETI. Jack holds a general class amateur radio license (KM4QJY). Description: When Stuart Hameroff, now age 71, was a young man entering medical school, he expressed an interest in the study of consciousness. So, his advisors encouraged him to become an anesthesiologist, who could watch patients go in and out of consciousness several times every day. He specialized in anesthesiology, and by 1994, as a practicing anesthesiologist in Arizona, he introduced what seemed at that time some outlandish ideas about the human brain. At the time few people believed him, until someone suggested he read "The Emperor's New Mind" published a few years earlier, and written by Nobel-prize winning mathematical physicist, Roger Penrose. Hameroff had proposed a theory of consciousness based upon his observations of patients coming in and out of anesthesia, but he lacked a mechanism. Penrose had suggested a possible mechanism to explain the theory. So the two teamed up to introduce a theory of consciousness which questions the current simplistic paradigm of firing neurons and synapses, and suggests that consciousness just may result from quantum physics activities at the subatomic level. These ideas could be as earthshaking as Galileo’s questioning of the earth-centered solar system, and open the possibilities for experiences based upon quantum physics: non-local out-of-body experiences; an afterlife within the space-time geometry; past-life regression and other phenomena currently defined as parapsychological. Karen O’Malia’s Bio: karen became interested in biology in high school; majored in French, and studied Spanish, art history, and biology as an undergrad; did graduate work in biology, with a concentration in ecology; went back to grad school later for a Master's in counseling. Continued to read on topics in biology, bio and organic chemistry, and medicine. Her three careers include teaching high school French, corporate financial sales and management, and legal pharmaceutical product liability case management. Note: If you missed this session, click here for a graph that will further explain Karen's presentation. Description: "How Medical Research Is Translated Into Improved Patient Care". Synopsis: For 32 years Helen was a surgical pathologist at New York University Medical Center. Her laboratory provided diagnostic services to patients during surgery in the hospital, in affiliated clinics, and in doctors’ offices. Acting in this capacity, the pathologist is often referred to as “the physician’s physician”; we don’t see patients, rather our service yields important information to the doctors who provide patient care. Being in an academic setting, she also had a mandate to do medical research (publish or perish!). Nowadays medical research requires a collaborative team approach. For 15 years she did research on kidney disease. Her team consisted of two pathologists, and internist, a pediatrician, three nephrologists, a urologist and a dialysis physician. For a subsequent 15 years my research was on breast cancer and her team included three surgeons, radiation and medical oncologists, a pathologist, a geneticist, and an endocrinologist. This switch in her research focus followed a year’s sabbatical at the Rockefeller University. She’ll use these experiences to illustrate how medical research translates into improved patient care. Barbara Chertok shared with us how she was suddenly deafened at age 21 and through the wonders of modern medicine and technology her hearing was restored. Barbara received her first cochlear implant in 1997 and her second in 2008. To read a recent article authored by Barabra, please click here. Emanuel (Bud) Klein presented a report and update regarding some of the latest exciting medical findings, and discoveries. Roger Streit presented a report on the Citizens’ Climate Lobby, Including its Work, Organization, and Accomplishments. Description: The federal government's best first step in addressing climate change should be to facilitate the transition from using greenhouse gas emitting fuels to using other processes that provide energy. Of the techniques that a government can use to facilitate this transition (subsidies, regulations, cap and trade plans, or taxes) a revenue neutral carbon tax plan is preferred. Such a plan grows the economy equitably and is a market-based solution that conservatives can support. For more than ten years Citizens' Climate Lobby volunteers have been relentlessly building the political will to advance such a plan, called Carbon Fee and Dividend. Evidence of their progress is building. In 2017, the Climate Leadership Council , a conservative group of Republican leaders, put forth its own concrete, market-based climate solution. Bipartisan cooperation is growing but we need more help. Roger Streit’s Bio:Roger grew up in Passaic, New Jersey. He majored in Economics at Lafayette College in Easton Pennsylvania and has an MBA in finance from the University of Rochester. He is a retired financial planner. He and his wife moved to Sarasota in September, 2016. Roger has been a member of Citizens’ Climate Lobby (CCL) since May 2013 when he helped start the Montclair, New Jersey chapter. He helped start the Venice Florida chapter in March 2017. Montclair was the 90th chapter of CCL. Venice was the 385th chapter. Roger has participated in more than a dozen lobby meetings with members of Congress or their aides. He will be talking about market-based solutions to climate change. They are gaining bipartisan support, but we need help. Barbara Kelly presented a Report describing her experiences, findings, and recommendations	based on her many years as principal of a large public high school that also included students from a school For the blind, and those from a school for the deaf. “Abortion in the USA – Do You Know the Facts?” (Current Statistics, Practices, and Trends). Brief Synopsis: Abortion in the United States has, and continues to be one of the most divisive political issues our nation faces. With the recent changes in membership of the Supreme Court, the issue is likely to again be front and center in our political debates. So, what do you know about abortion? In this presentation, Dr. Dale Anderson will provide an overview of the women who seek medical and surgical abortions and the methods of abortion used in the USA. Mike Gruendfeld, the leader of the Science, Technology & Medicine discussion group, presented "Brain-Computer Interfacing, and Methods for Improving Brain Function." Description: Brain-Computer interfacing sounds like the stuff of science fiction, but it is already used to treat many severe human maladies, including epilepsy, paralysis, deafness, Parkinson’s disease, and others. Treatments entail inserting wires and sensors into, onto, and near living patients’ brains, and interfacing these with artificial intelligence (AI) equipped computers. Research now underway, and planned, aims not only to relieve suffering, but also to read minds, dramatically enhance learning and memory, and ultimately establish superhuman-like connections between human brains and computers. Procedures already used, and planned, for correcting brain-body malfunctions, and establishing brain-computer communication, will be described and discussed. Mike Gruenfeld’s Bio: Mike spent most of his childhood in the British protectorate, Palestine, and in Israel, after it declared its independence. He arrived in the US at age 13, and resided in New York City. After completing High School and College, and marrying Holly, the family (now four) moved to a lovely town in New Jersey. Mike worked as an analytical chemist, managed an environmental research laboratory, supervised chemists and engineers, chaired committees of the American Society For Testing and Materials (ASTM), published scientific papers, and provided technical seminars at scientific conferences. To read Mike's full presentation paper, please click here. Summary: There have been thousands of inventions, throughout the centuries, but how many have actually reinvented us? Barry will focused on the tool that has had more impact than practically any other, and how what used to be called Science Fiction became Science Future and how has now evolved into Science Fact. For a transcript of this presentation, please click here. Summary: Mary McClendon described her long experience as both a teacher of mathematics in public schools, as well as her experience as the supervisor of the teaching of mathematics in the Sarasota County public school system. She focused on two areas where appropriate teaching methods and practices can help students achieve success. One area addresses the development of appropriate vocabulary, and the other addresses the development of important concepts. These are paradigms in mathematics education that she will share with the group. Mary McClendon’s Bio: Mary supervised all K to 12th grade mathematics education by all teachers of mathematics in the Sarasota County public school system. She started her career in a one room school, and at the age of 20, she was teaching 29 kids in grades 1-8. Prior to receiving her PhD, she taught in Wisconsin, Iowa, and Florida. Mary also taught mathematics methods at the University of South Florida, and after retiring in 1996, she did teacher training for two companies, and also wrote textbooks for Harcourt Brace Publishers. Description: Susan Silva-Wayne and Jack Wayne will lead a discussion on the current strengths and weaknesses of the provision of health care in Canada. They will outline the workings of the Canadian Health Care system, its benefits to the residents and the gaps in service needing to be addressed. Some anecdotal material will be included. Susan Silva-Wayne’s Bio: Susan earned her BA degree (SUNY Binghamton), MSW (University of Michigan) and Ph.D. (Wilfrid Laurier University, Ontario). As a social worker, therapist, social work educator and book editor, she has developed special interests in the areas of Child and Family Life, Child Welfare, Women's Studies, Domestic Violence and Human Sexuality. She has experienced her own health challenges and learned about those of many others in New York, Michigan, Wisconsin, Florida and England as well as in Canada. Jack Wayne’s Bio: Jack was born in Canada. His first full-time job involved giving motivational talks to inmates of Ontario’s Mental Health Hospitals. Unfortunately, the provincial government in the mid-1960s declared all Ontario residents to be sane and Jack found himself unemployed. He went back to school and was awarded a Ph.D. in Sociology. Dr. Wayne was a professor of Sociology at the University of Toronto for over 30 years. After the third decade Jack realized that his academic career wasn’t working out. He declared his students to be fully educated and turned his attention to textbook publishing. His firm, Canadian Scholars’ Press Inc., is now the leading Canadian-owned textbook publisher in Canada. It enjoyed remarkable growth after Jack sold the company in 2008. Dr. Wayne is a Past-President of the Association of Canadian Publishers. Jack is now a fine art photographer. He is a member of the Propeller Centre for the Visual Arts in Toronto. In 2018 his major new exhibit, Masculine and Feminine, will open at the Propeller Gallery in Toronto June 20th, 2018. From stents and open-heart surgery to medications, many common treatments have been shown to be ineffective, and sometimes harmful. Yet physicians and surgeons continue to prescribe drugs and perform procedures and surgeries long after they have been shown to be ineffective. Why? Because common “knowledge” dies hard, and because profit remains a strong motivation. Effectiveness is clouded by poor research and experiments designed to overstate positive outcomes. “Relative risk is just another way of lying,” implying that the treatment is far more effective that it really is. A more reliable way of reporting outcomes of medication and surgery is NNT, number needed to treat, and NNH, number needed to harm. Both are measures of how many people need treatment to get one positive outcome, and, conversely, how many of those treated will experience a negative outcome. For the article used in the preparation of this talk, please click here. Karen O’Malia discussed CRISPR DNA & Gene Editing Technique (Genetic Engineering). The house was packed to hear Karen's talk. This is a subject that is geting wide attention throoughout the world. Maybe they can now do something about that gene that can damage you, and end your life prematurely? Below is a chart that might help you understand the CRISPR methodology. This session featured two speakers who discussed subjects close to the heart. Ernie Kinnie (left), and Jack Robinson (right), who passed away recently. We will miss him. An enthusiastic crowd offered wise input to the discussion. Bud Klein, MD, presented his views on Intestinal Bacteria & Health. Bud spoke about, and explained, that the secret of happiness may lie within the gut, and he will explain the multitude of other bodily activities that are happening there. He described just about everything that has become known about the intestinal biome. 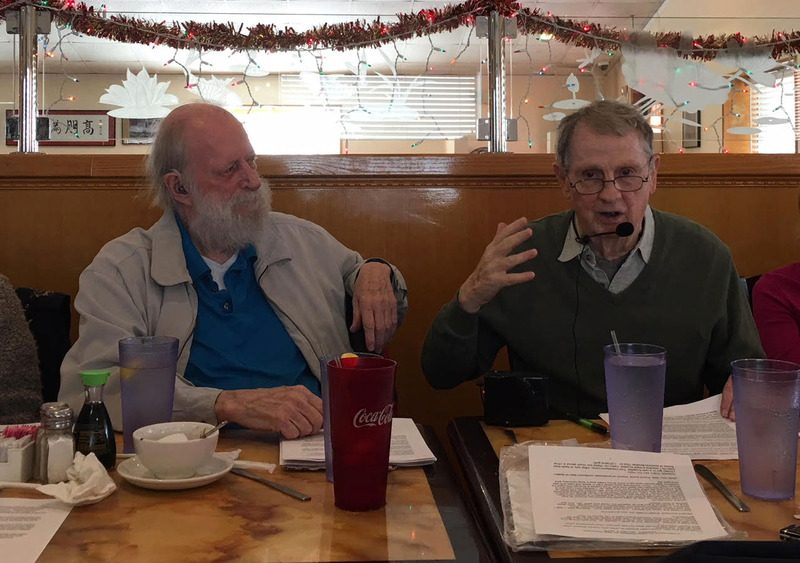 Members, Ernie Kinnie and Barry Zack, went at it again on a subject near and dear to their hearts (well, at least Barry's heart). They presented their cases on the subject of Climate Change. Ernie distributed his referenence notes at the meeting. Barry, Tree-Hugger that he is, made his notes available in an electronic version, which you can view by clicking here. Mike Gruenfeld, the leader of this group presented to the audience his take on Immune Checkpoint Inhibitors - A New Frontier for Curing Cancer? Description: Discussed is the discovery and use of a new drug that has an entirely novel and effective mechanism for combating cancer. Instead of attacking cancer cells (e.g., by using chemo), or by indiscriminately revving-up the immune system (e.g., by using IL-2), this new drug accomplishes cures by blocking a single receptor on a specific type of immune cell. September 6: - Susan Dana stepped up to do a report on "Grief and Loss: Universal Yet Unique"
Description: At our stage of life, everyone has experienced the death of loved ones and other painful losses. While universal, each of us experiences and manages loss in our own unique way. As a professional nurse, Susan specialized in helping families who experienced infant loss. She has also experienced the death of her own son. She will share suggestions of people about what was helpful, and not helpful, at the time of their losses, and will invite discussion among attendees about their learnings from losses in their own lives. August 2 -Mike Gruenfeld (the leader of this group) took center stage. 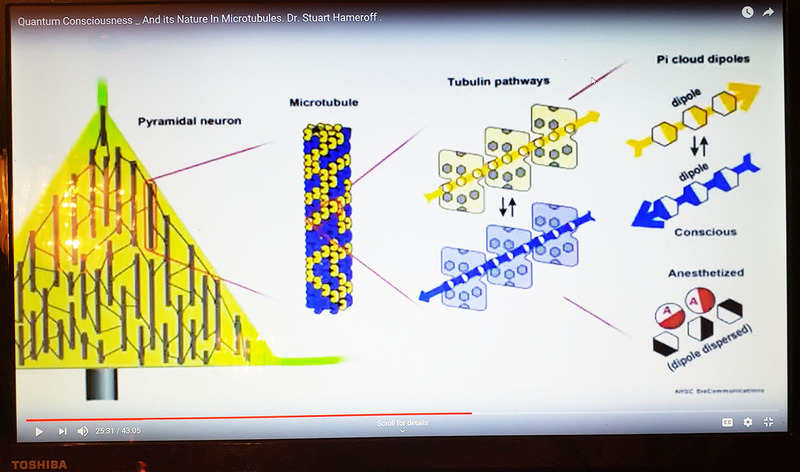 Description: Mike’s presentation was about this stunning video in which Prof. Stewart reveals how the greatest changes to the Earth have been driven by plants. In his film, Prof. Stewart describes how plants first harnessed sunlight to create oxygen, and the epic battle between dinosaurs and the tallest trees. He describes the development of leaves, and shows plants breathing, and even communicating. The development of the first flowers, which brought color and dramatic changes to plant and animal evolution, and kick-started human evolution, are also described. The enormous impact of one plant in particular, i.e., grass, is discussed in great detail, and how grass unleashed firestorms to fight its greatest enemy, the forests. And finally, how one kind of grass (i.e., wheat) triggered human civilization. July 5: "Cosmology News" was presented by Dan Dana. Dan discussed recent findings about the Big Bang Theory, dark energy, dark matter, black holes, gravitational waves, cosmic background radiation, multiverse speculations, the ultimate fate of the universe, and other related topics. June 3: - The session was postponed die to inclement weather. May 3: - The session was presented by Jo Ellen Silberstein. Have you ever wondered what life would be like not to be irritated by someone cutting in front of you in line, or, in traffic? Or, when someone is late? Or by a “difficult” friend or family member? What would it feel like not to mentally compare yourself to someone else — be jealous, or rate yourself now against who you were five, or 10 years ago? My journey with these practices started four years ago. Last month, I completed a 90-day, solitary meditation retreat. I have personally benefitted from the practices I have learned by a marked decrease in the frequency, intensity and duration of stress, anger and other unhelpful emotions, and a profound increase in happiness, joy, love and equanimity. April 5: - Jack Wayne led the discussion. The basis of his talk was an article, "Gravesites and Websites:" A Comparison of Memorialisation" by Connor Graham and other authors. The article describes the increasing use of websites to remember the dead, and how the relationships between the living and the dead are changed by this new medium. A gravesite is now an offline memorial and Facebook and other apps supply an online place to remember the dearly beloved. Questions about a new view of heaven in somewhat different clouds are raised by these ideas. Science is the most valid source of information about humans and planet earth. It has provided wonderful gifts such as longer, healthier lives, and machines that keep us amused and creative. But best be aware of the influences on scientists that affect the validity of their work. Scientists have too often accommodated the needs and agendas of governments, businesses, interest groups, and themselves. Wittingly or unwittingly. As a result, faith in science as a valid source of information is being seriously damaged. And the damage is likely to increase as it becomes clear in the next year how badly many of the recent pronouncement of science have been politicized and bastardized. Note: You can read more about this presentation by clicking on this link. Feb 1: Karen O'Malia Zauderer provided a presentation on two genetics-related topics. 1. Epigenetics, how your environment and your choices can influence your genetic code—and that of your kids. Evolutionary theory and Darwinian evolution argue that random mutations in DNA, resulting in selective advantage, drive evolutionary adaptation. Recently studies by Bygren and others “have given birth to a new science called epigenetics... the study of changes in gene activity that do not involve alterations to the genetic code but still get passed down to at least one successive generation. These patterns of gene expression are governed by the cellular material—the epigenome—that sits on top of the genome just outside it. It is these epigenetic ‘marks’ that tell your genes to switch on or off. It is through epigenetic marks that environmental factors like diet, stress and prenatal nutrition can make an imprint on genes that is passed from one generation to the next.”-- Time, January 18, 2010. 2. CRISPR, a gene-editing technique that can “quickly and efficiently manipulate virtually any gene in any plant or animal. . . Researchers have used it to fix genetic diseases in animals, combat viruses, sterilize mosquitoes and prepare pig organs for human transplants.”—Science News, August 24, 2016. “CRISPR is a molecule that finds a string of DNA code, locks on and makes a precision cut.”—Cosmos, August 14, 2016. The technique holds promise for altering genes in every type of organism—to prevent the browning of mushrooms, excise HIV from human cells, increase milk production in cows, enhance flavor of tomatoes, re-introduce edited cells into multiple myeloma patients, etc.—Time, June 26, 2016. “Designer babies” become a possibility with CRISPR. A discussion of two recently published scientific articles. One article describes exciting new research for treating and often curing some forms of cancer, with cures of other forms of cancer to follow. The second article describes the rediscovery of a quick way for treating and often curing sufferers of post-Traumatic Stress Disorder (PTSD), and sufferers of severe depression. Bob Rosnsky was up next. Below is a summary of his talk, "Evolution, Characteristics, and Abilities of the Domestic Dog." Over the past few decades, research in the hard and soft sciences reveal dogs are capable of higher level thinking. Of course, data input is a crucial aspect of cognition and behavior. Due to time constraints, Bob limited his talk to an overview of the domestic dogs' world as processed through sensation and perception. Presumably, this will offer insights as to why dogs behave as they do. December 7, 2016: Barry Zack presented the promises of technology, and how it will affect future medical treatment -how doctors will partner with technology to bring far better results. This Doctor Watson is very different from Conan Doyle's. It's one that fits our category of science, technology and medicine, and is appearing in the 21st century. This Watson has no medical degree, and lacks human characteristics, but can store volumes of information about our human bodies. With that new found knowledge, the medical profession will far more accurately diagnose what ails us, and assist in prescribing the correct procedures, removing much ofthe guesswork. This should come as welcome news, especially to folks in our age group. For a PDF of Barry's presentation, please click here. .
On November 2, 2016, Ernie Kinnie led off the first meeting of this group with: "A WARCRAFT A DAY KEEPS ALZHEIMER'S AWAY"
Advances in the technology of computer gaming has yielded gathering evidence that a massive, multi-player, online, role-playing game like World of Warcraft is an excellent tool for children as early as kindergarten to learn basic skills in math, grammar, spelling, social interaction, and hand-eye coordination. And, the use of such computer gaming technology by middle-aged and older adults results in vigorous exercising of both hemispheres of the brain. Also, the continuous interaction and competition with other gaming competitors may also contribute to warding off or delaying the devastating effects of dementia and Alzheimer’s in the elderly. At the least the game keeps kids busy and out of trouble, and reduces the boredom and isolation sometimes found in the elderly. This presentation will describe how World of Warcraft provides all these wonderful benefits, and also describe some of the possible negative effects pushed by nagging nannies who don’t want anybody to have any fun.